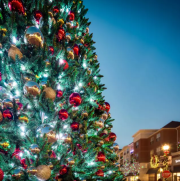 The holidays are around the corner and a lot is happening in Loudoun! From anniversary celebrations, to tree lightings, to grand openings and more, there’s something for everyone! We hope you enjoy your weekend in Loudoun and don’t forget- use hashtag #LoveLoudoun to show us your weekend fun. 8th Annual Tree Lighting Festival: There’s nothing like getting into the holiday spirit with Santa! Join Santa as he arrives by horse-drawn carriage to light the Spectacular Musical Tree at the Village at Leesburg on Saturday, November 18th. Can you guess how many lights are on this 5-story tall tree? 15,000! You wouldn’t want to miss this fun, family event! Festivities include horse-drawn carriage rides, live performances, holiday characters, fire pits and much more! The event is free but all who come are encouraged to bring a donation for Toys for Tots. 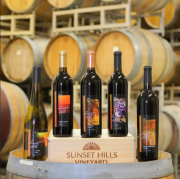 Great Wines for the Greater Good: Sunset Hills Vineyard is celebrating their 9th anniversary and what better way to celebrate than to taste award winning wines with friends and family? The anniversary celebration will be held on Saturday and Sunday and all who join will have a chance to taste food from Roots 657 Restaurant, view Mike Canney’s race and vintage cars and hear live performances by Todd Brooks and Jason Masi. The owners of Sunset Hills are focused on giving back to their community and will be giving a check to Dr. Ben Park for his research in breast cancer. Read more about Dr. Ben Park’s research by clicking here. Grand Opening of the Round Hill Local Store: Round Hill is a quaint town but thanks to a local family, they’re opening a store where “local offerings and the basics” will be featured! Check out the Grand Opening on Saturday, November 18th from 12-3 pm for your chance to enter and win a cash drawing! All proceeds from ticket sales will go to Kids with Cancer. Numerous vendors will be present to show off their local products. These vendors include: Notaviva Vineyards, Veritas Artizen Chocolate and more!